Home Forums Synfire Installation, Sound Setup and Import/Export error message that says "Unhandled Exception"
error message that says "Unhandled Exception"
I receive an error message that says "Unhandled Exception: Too many levels of symbolic links." Thanks for any ideas on how to get up and running. Today, when I tried to open it I couldn't open SynFire Pro at all. This is an error bubbling up from macOS. There are cyclic links in your file system, probably involving a symbolic link pointing back to itself. Synfire merely happens to stumble upon it during startup. I get a long list of pathnames. Twenty-one pages of links, to be exact. I'm not a programmer, so I don't dare tamper with these files. And after a long online support chat, Apple Technical Help has just told me that they can't help me. They have just referred me back to you Andre, as they won't look into anyone's Terminal as a rule of policy. 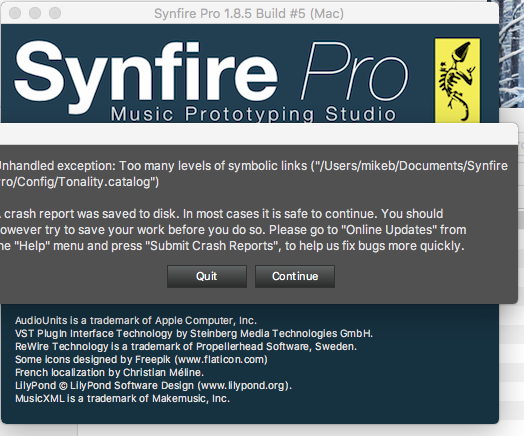 Just out of curiosity - why is SynFire Pro the only software that I have that won't operate because of these links? Is there really no way to workaround this? Any other software that would come across the corrupted symlink on your hard drive would throw this message, too. It is not specific to Synfire. The solution is to find and remove that link. I've just sent you a list of the results for the Terminal command 'ls -l' on my machine. Thanks if you can have a look. Replace 'Config' with anything you expect in the filename, e.g. 'Tonality.catalog'. Since I don't have corrupt symlinks on my drive, I can't test.